Changes in teen participation in specific risk behaviors have been well documented. What is less known, and of growing concern, is how overall teen risk-taking has changed. In addition, information is lacking about the nuances in the behavior of adolescents who engage in more than one of these risks at a time. Teens who participate in multiple risks increase the chance of damaging their health. Teens overall involvement in risk-taking has declined during the past decade (except among Hispanics), with fewer teens engaging in multiple risk behaviors. 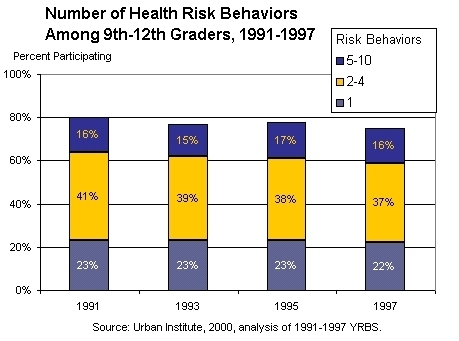 But multiple-risk teens remain an important group, responsible for most adolescent risk- taking. However, almost all risk-takers also engage in positive behaviors; they participate in desirable family, school, and community activities. These positive connections offer untapped opportunities to help teens lead healthier lives. The data and discussions in this report are based on analyses of three recent national surveys: the Youth Risk Behavior Surveys (YRBS), the National Survey of Adolescent Males (NSAM), and the National Longitudinal Study of Adolescent Health (Add Health). The authors caution that a number of qualifications should guide interpretation of the information provided in this portrait. For example, many of the behaviors are measured with reference to different time periods. Questions about substance use and weapon carrying, for instance, refer to the 30 days prior to the survey; those about suicidal thoughts, suicide attempts, and fighting refer to the year before the survey. Also, both the YRBS and Add Health studies only include students and cannot be used to generalize to all adolescents, including those currently out of school. The surveys likely underestimate the prevalence of risk behaviors among all teenagers, since those who drop out of school are at higher risk of engaging in risk behaviors. Estimates of risk behaviors among older adolescents will be particularly affected, since they are more likely to drop out or to have completed school. This report was prepared for ASPE by the Urban Institute. The project officer, Kevin Hennessy can be reached at (202) 690-7272. The report can be found at http://aspe.hhs.gov/health/reports/TeenRisk/TeenRiskTaking.pdf. Until recently, cardiovascular disease (CVD) was uncommon in Native Americans. Today CVD has become the leading cause of death in Native Americans. However, there is little data available describing clinical outcomes related to cardiovascular risk management in this population, especially in the area of lipids. This study reports on lipid management outcomes associated with a cardiovascular risk reduction program for Native Americans. The medical, pharmacy and dietary staff of the Santa Fe (New Mexico) Indian Hospital pioneered the first Indian Health Service lipid management program in 1997, which evolved into the Native American Cardiovascular Risk Reduction Program (the Program). Today the Program offers comprehensive CVD risk reduction through prevention and management of dyslipidemias, obesity, inactivity, tobacco use, diabetes, and hypertension. The Program serves the Native American population of eleven Rio Grande Pueblos and numerous urban Indians through a rotating clinic that visits various field stations, health centers and the Santa Fe Hospital on a weekly basis. After assessing for CVD risk, a licensed pharmacist clinician (PhC) establishes patient specific CVD risk reduction goals and initiates an individualized treatment plan that incorporates increased physical activity, dietary changes, and/or pharmacotherapy, if needed. After the initial 60-minute visit with the PhC, a one hour visit is scheduled with the Program dietitian within a 2-6 week time period. The primary nutrition intervention strategy utilizes the American Heart Association’s diet in conjunction with an increase in dietary fiber and physical activity. There were seventy-four patients enrolled in this evaluation study program from March 1997 through October 1999. The patient mean age was 60 years old, with an almost equal representation of men and women. Patients were categorized into three LDL-C treatment groups based on CVD risk. Group I consisted of nine (9) patients at low risk. Group II consisted of 15 patients at high risk. Group III consisted of 50 patients at highest risk with CVD and/or diabetes. Of the entire cohort of 74 patients, 41 (55%) reached and/or remained at LDL-C goal for the given risk group during the evaluation period. The results show a significant benefit that a focused cardiovascular risk reduction program can have in a culturally unique population. Diet and lifestyle modification efforts appeared particularly effective in those with few additional risk factors, often achieving therapeutic success with minimal, if any, pharmacotherapeutic intervention. In those with multiple cardiovascular risk factors, known CVD or diabetes, non-pharmacotherapeutic interventions were shown to be integral in the attainment of lipid level goals and appeared to reduce the need for pharmacotherapeutic intervention. This report was prepared by the Indian Health Service. The project officer, Deborah Melton, can be reached at (301) 443-2417. The report, PIC ID#7139, is available in the PIC. In the United States today, one in 10 children and adolescents suffers from mental illness severe enough to result in significant functional impairment. These children and adolescents are at much greater risk for dropping out of school and suffering long–term impairments. In light of the pressing needs of children and adolescents with mental illness, the NAMHC recommended to Director of the National Institute of Mental Health (NIMH) that a Workgroup be established. The Director of NIMH charged the group with reviewing research and training to (1) assess the status of the NIMH portfolio and identify research opportunities in the development, testing, and deployment of treatment, service, and preventive interventions for children and adolescent in the context of families and communities; (2) assess the human resource needs in recruiting, training, and retaining child mental health researchers; and (3) make recommendations for strategically targeting research activities and infrastructure support to stimulate intervention development, testing, and deployment of research-based intervention across the child and adolescent portfolio. A child’s environment, both in and out of the womb, plays a large role in shaping brain development and subsequent behavior. Studies of the caregiving environment suggest that extreme environments (such as abuse and neglect) may affect brain cell survival, neuron density, and neurochemical aspects of brain development, as well as behavioral reactivity to stress in childhood. Research has demonstrated the remarkable plasticity of the brain and, in certain neural systems, the ability of the environment to influence neural circuitry during childhood. Progress has been made on the identification of developmental models that describe how cumulative risk factors contribute to adjustment problems and mental disorders, including conduct problems, substance abuse, high-risk sexual behavior, and depression. Research has now documented that psychosocial interventions and services may also enhance the impact of pharmacological treatment. There is an increase in the rate of outpatient mental health service use since the 1980's; however, only 5 percent to 7 percent of children receive some specialty mental services, in contrast to an estimated 20 percent with a diagnosable mental disorder. The report recommends that NIMH create support for the implementation of Child and Adolescent Interdisciplinary Research Networks (CAIRN’s) to strengthen and accelerate research on intervention development and deployment. The report recommends interdisciplinary research training in child and adolescent mental health. Program development in specific research areas, such as: neuroscience, behavioral science, prevention, psychosocial interventions, and psychopharmacology. NIMH oversight of these recommendations to address ethical issues that may arise such as informed consent, confidentiality, and risk assessment with which to guide investigators. This report was prepared for NIH/NIMH by the National Advisory Mental Health Council. The project officer, Kimberly Hoagwood, may be reached at (301) 443-3364. The report is available on the web at: http://www.nimh.nih.gov/childhp/councildesc.cfm. Prison inmates have much higher rates of human immunodeficiency virus (HIV) infection than the total U.S. population. Prison systems are responsible for providing health care for all inmates during incarceration and therefore make a significant investment in treating HIV-infected inmates. The vast majority of prison inmates return to society. This study looks at the systems in place that are to provide continuity of care when HIV- infected inmates leave prison. In 1999, the Centers for Disease Control and Prevention (CDC) examined discharge planning programs for HIV–infected inmates in California, Connecticut, Florida, Georgia, Maryland, Massachusetts, New Jersey, New York, Pennsylvania, and Texas. A total of 96 respondents, representing correctional health care departments, parole agencies, state and local public health departments, and community-based organizations, participated in the study. The purpose of the study was to identify and describe (1) the discharge planning systems for HIV-infected releases currently in place in the ten states; and (2) the key policy and programmatic elements that influence continuity of care for this population. The ten states studies have achieved varying degrees of program availability and comprehensiveness. Eight of the ten states studies offer some pre-release discharge planning services to all HIV-infected inmates (at least arranging a medical appointment). Four of these states provide all HIV-infected inmates with comprehensive linkages to medical and social services. But only two of the eight (8) states provide both pre- and post- release services statewide. One state provides discharge planning only to parolees with HIV, with post-release case management in some parts of the state. One state does not have any discharge planning system in most facilities. Dedicate funding for discharge planning and post-release follow-up. Assign designated staff to discharge planning, including a discharge planning coordinator at each facility and statewide. Arrange for state public health department collaboration and oversight of continuity of care programs. Establish collaborations with outside community-based organizations and agencies that meet with inmates prior to release. Involve parole officers in supporting reintegration and continuity of care. Inmates usually must wait until after release to apply for benefits. Processing applications can take weeks or months, leaving qualified ex-offenders without access to health care and financial support in the critical period after release. Inmates usually cannot apply for emergency or permanent housing programs until after release because technically they are not homeless during incarceration and thus do not meet the admission criteria for housing programs. Public and private housing providers can legally deny housing to ex-offenders, a common problem. In many states, HIV-infected individuals without an acquired immunodeficiency syndrome (AIDS) diagnosis do not quality for any publicly funded health coverage or disability benefits (e.g., Medicaid, SSI). This report was prepared for CDC by Abt Associates. The project officer, Karina Rapposelli, can be reached at (404) 639-8862. A copy of the report (PIC ID# 7749) is available in the PIC. In order to reduce the tremendous health and economic burdens of disease in the U.S., the federal government and other public and private stakeholders increasingly emphasize disease prevention and risk factor reduction. This report addresses both primary and secondary prevention efforts. Primary intervention denotes interventions taken to prevent the development of a disease in individuals who do not have the disease in question. Secondary prevention denotes the identification of individuals who have developed a disease at an early stage in the disease’s natural history, followed by early intervention to prevent mortality or complications of the disease. The purpose of the report is to further the understanding of the role of the Department of Health and Human Services (HHS) in the dissemination and implementation of research findings related to health promotion and disease prevention. The report describes HHS’ roles in prevention activities and it identifies factors critical to the effective translation of research findings into clinical and public health practice and into individual behaviors that promote health. The prevention process can be conceptualized as consisting of five phases: (1) research, (2) translation into findings and recommendations, (3) dissemination to targeted audiences, (4) intervention, and (5) evaluation. This study also specifically discusses methods for optimizing the roles of target audiences and HHS dissemination partners, which are integral to all five phases of the prevention process. Drawing from experience with HHS prevention programs, case studies of particular initiatives, analysis of literature on prevention, and input from experts in the field, this study has derived a set of lessons regarding how to improve the design, development, and strategic implementation of successful prevention efforts. The lessons learned from this study (detailed below) provide insight into how HHS can enhance current efforts and respond to future opportunities and challenges in the realm of prevention. Prevention efforts should account for the nature and attributes of target audiences in order to conduct more effective preventive health research, translation, dissemination and interventions. Prevention research should include a renewed and earlier emphasis on ongoing evaluation, which includes the development of evaluation plans and means for incorporating evaluation results prior to program implementation. The quality of scientific evidence in support of a prevention intervention does not necessarily correlate with the degree of uptake or adoption of the intervention. Prevention intervention messages should reflect or be accompanied by indications of the strength of the evidence in support of the intervention, even when the evidence is weak, equivocal, or conflicting. Simpler educational messages may increase the likelihood of adoption or uptake of a preventive intervention. Likewise, complex messages may be more effectively disseminated if they are broken into smaller components. Prevention programs should place greater emphasis on active dissemination rather than passive diffusion of prevention messages. Clinicians and other health care providers can each be effective in disseminating prevention messages. However, single-source prevention messages are rarely sufficient, and complementary sources should be investigated and employed as appropriate. Prevention initiatives should choose strategically from among alternative means for implementing interventions, including education, regulatory approaches, reimbursement policies, and others. HHS partnerships with non-federal entities can be vital to successful prevention efforts, particularly when formed prior to the dissemination or intervention stages of prevention. Improved coordination and communication on prevention matters within HHS make available cross-agency expertise and resources, and increases the impact of prevention messages. This study was prepared for ASPE by the Lewin Group. The project officers are Sandra Howard (202) 690-7778 and Andrea Pernack (202) 690-7807. This report, PIC ID# 7347, can be obtained from the PIC. The Policy Information Center (PIC) at the Department of Health and Human Services (HHS), is a centralized source of information on policy research and program evaluation studies, completed as well as in progress, that are supported by HHS agencies or staff offices. PIC also includes studies on HHS programs that are conducted by other organizations. The PIC on-line database at http://aspe.hhs.gov/pic provides project descriptions of these studies. Inquiries about PIC services should be directed to (202) 690-6445 or webmaster.pic@hhs.gov. The ASPE Highlighter is now available as an electronic newsletter. If you wish to sign up to receive the ASPE Highlighter newsletter, please email listserv@list.nih.gov with “SUBSCRIBE ASPE-HIGHLIGHTER” as the message, or sign up here.